The Texas Rangers’ Adrián Beltré became just the fourth major league player to hit for a third career cycle on Monday, and all three were accomplished in Arlington, Texas. Beltré hit his third cycle Monday night during the Rangers’ 12-9 win over the Houston Astros with a triple (first inning), double (second inning), single (third inning) and homer (fifth inning). 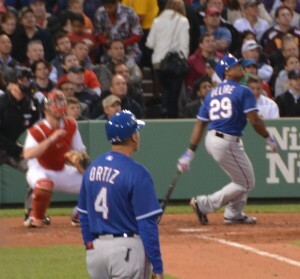 Beltré’s first cycle came on September 1, 2008 against the Rangers when he was a member of the Seattle Mariners. He notched his second on August 24, 2012 at home against the Minnesota Twins. The three cycles puts him in a tie with three other major leaguers. Long John Reilly hit for the cycle twice in 1883 and once in 1890, Bob Meusel did it in 1921, 1922, and 1928 and Babe Herman cycled twice in 1931 and once in 1933. Cycles are just slightly more common than no-hitters. There have now been 308 cycles in the majors, compared to 290 no-hitters.